In doing my New Year reading challenge, my first book was one called Memoirs of a Medieval Woman, written by historian Louise Collis. The medieval woman in question was Margery Kempe. Margery was born around 1373 and died sometime after 1438. She was a wife, daughter of a noted mayor, then a mystic, pilgrim, and finally, through her autobiography which she dictated, a commenter on medieval mores and religion. She had become a Catholic Mystic during the time of the rise of Wycliffe and his followers, the Lollards. She was a contemporary of another noted female mystic, Julian of Norwich. Hers is an interesting book on socioeconomic, cultural, and religious insights. 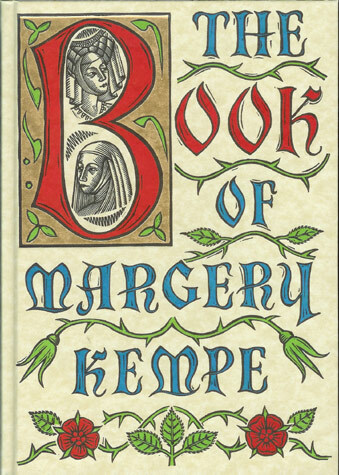 The Book of Margery Kempe is considered to the first autobiography in the English language. It’s also written in middle English and is nearly incomprehensible. That’s where Collis comes in. She writes about Margery in her book Memoirs of a Medieval Woman, and uses a healthy sprinkling of Margery’s original words, but fills in the background with historical contexts and explanations. Collis never intrudes on Margery’s voice, but Collis’ writing enhances the contextual picture we get of Margery as she goes about her extraordinary life during a turbulent political and religious time. Around 1300, centuries of prosperity and growth in Europe came to a halt. A series of famines and plagues, including the Great Famine of 1315–1317 and the Black Death, reduced the population to around half of what it was before the calamities. Along with depopulation came social unrest and endemic warfare. France and England experienced serious peasant uprisings, such as the Jacquerie and the Peasants’ Revolt, as well as over a century of intermittent conflict in the Hundred Years’ War. To add to the many problems of the period, the unity of the Catholic Church was shattered by the Western Schism. Collectively these events are sometimes called the Crisis of the Late Middle Ages. Frustration with the Roman Catholic Church, empty pocketbooks, demands for excessive tithes and indulgences to Rome, the rise of the Lollards (Wycliffe followers), the Church’s reaction by burning them at the stake, the Council of Constance, all formed the dominating religious landscape in which Margery lived. As for the Council of Constance, this was a pivotal moment in Catholic church history. Jan Hus was a forerunner to Wycliffe and both men are considered the first, early reformers of the Church prior to Martin Luther. Hus had preached against the excesses of Rome and had used Wycliffe’s writings from the pulpit. These incendiary preachings came at a time during Margery’s life when the great Papal schism occurred. There were three popes at one time and the church was under heavy attack, splintered and staggering under its corruption and lack of direction. The Council of Constance was the RCC’s answer to this attack on its power. Remember, the Roman Catholic Church was a governmental authority, not just ecclesiastical. Kings and Popes were in league. The king used the church as a way of paying the civil service. As [ecclesiastical] incumbents were often ambassadors, ministers, or secretaries, deputies had to be found to look after the souls theoretically in their care. Perhaps, in some cases, the deputies were good and conscientious servants, but such a system made the church seem even more distant, wrapped away in a huge organization, far from everyday needs. Under these circumstances, the late medieval mystics on the one hand, and the Lollards on the other, became very popular. They brought God close to the individual. One could communicate with Him directly. He would listen to one’s troubles in a sympathetic manner. Advice could be obtained, the tedious and often incomprehensible rituals of the church could be by-passed. Private devotions became a habit amongst many of the new middle class, to which Margery belonged. Such people were accustomed to rely on their own judgment in the business world. There had always been a place in the church for the hermit or anchorite. [Anchorites remained in their cells, studying and praying. They spoke only through a window. Hermits came out to preach and were often responsible for the upkeep of a bridge or a piece of road.] Anyone could apply to be enclosed. Their prayers brought them near to God. Sometimes they could foretell the future, or heal diseases. They could guide their disciples toward those visions which were a foretaste of paradise. Their doctrine was personal and emotional. One must adore God with all the strength of one’s being and meditate steadily on the Passion, that example of Christ’s love of man. By means of assiduous prayer, fasting and contemplation, some reached a stage where they heard strange melodies played, as it were, in heaven by the angels. Others felt an extraordinary warmth, as of divine fire, suffuse them. Others wept uncontrollably. If the descriptions of the Mystics’ experiences of hearing voices & whispers, singing, and feeling a warmth running through their body sound familiar, it is because the modern day mystics such as Sarah Young (author of Jesus Calling) et al have said they experienced those exact things too. Satan does not vary his schemes, though a solid Christian is aware of them. (2 Corinthians 2:11). The RCC had become so remote and distant, so cold and demanding, so corrupt and perverse, that the people didn’t equate the Church with divine solace or a relationship with Jesus at all. They still desired a personal relationship with God, though, because it is in man to worship…something. (Ecclesiastes 3:11). In Collis’ explanation of the people’s medieval search for God, we read there were those who were interested in Wycliffe’s approach, and there were those who were Mystics or who followed Mystics. As the Bible says, there are the two paths, one leading to perdition and punishment, and the other to Jesus and eternal peace. We can see how the Lord prepared the ground to receive Wycliffe and Hus’ appeals to read the Bible directly in order to know God. We can also see why Mystics (and anchorites and hermits) had become so popular. They filled the roles of fellowship and wisdom the people needed, as wrong-headed as these all were. The Mystics offered a personal religion so different from the incomprehensible rituals and coldness of the Church. It’s no wonder people were drawn to them. In Margery’s case, pride and vanity had been her besetting sins prior to her demonically led mystical life. In her book she at times mused that she hoped she would become more famous than Julian of Norwich or as well-regarded as a Mystic who had lived in an earlier time, Bridgit of Sweden. She was obsessed with accumulating relics. Relics were the religious items sold at holy sites which purported to be, for example, a splinter from the true cross, John the Baptist’s true finger, a brick from the true home in which Mary lied, Jesus’ actual blood, and so on. Margery exuded enough holiness to the authorities to have received their blessing and support. She was tried several times for heresy but always found innocent. However, the lay-people were split. Some said she was demon-possessed, others admired her seeming sincerity. And she was sincere, but sincerely misguided. Her fits of crying and constant blunt exhortations to all hearers to straighten up their lives and live right, grated. She was evicted from her traveling group on pilgrimage many times yet these evictions never altered her unteachable spirit to become more introspective. The Lollards on the other hand were well-regarded by the people. They preached the word, lived simply and honestly, and went about on the true pilgrimage with all love and appeals to win people to Christ. Margery Kempe was definitely a force to be reckoned with. She was loud, noisy, rebellious to the true Christ, intrepid, fearless, and most likely totally shocked when she died at a healthy old age (unusual for medieval times) and faced the true Christ. Aside from learning of the ripe ground onto which Wycliffe and Hus’ blood spilled in their effort to bring God’s word to the people, I learned just how persevering the devil is in getting someone to believe they are truly saved and then gets them to move mountains. Margery was an anti-Lydia, and anti-Dorcas. She accomplished much for satan’s kingdom, turning the lives of all she encountered upside down. If we who have the Spirit in us were half as single-minded and dedicated to the true cause as Margery was to her false cause, we would all turn our worlds upside down.